I just got my white dr Martens, I'm so glad! I've been wanting them for years and finally my parents bought them to me as a Christmas present!! Ok maybe you don't care about my shoes but I wanted to post an outfit with them so you can use it as an inspiration. 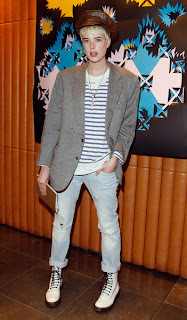 I chose one of Agyness Deyn's outfit; I love her style, I think she doesn't look like other models. She has a very punkish/ grunge style and you can really see the british influence. Also her outfits are really easy to take inspiration from or recreate, she chooses really simple clothes that you can find really easily, and spices everything up with some colorful details and/or accessories.